The Capgemini Week of Innovation Networks is a worldwide Business and Technology event which brings together Clients, Partners, Experts and Start-ups to share insights on latest innovations and technology trends. Six of our participating CWIN cities will cover the event live. Please click on the cities below to watch the livestream and detailed sessions agenda. Register now to participate in an event near you. 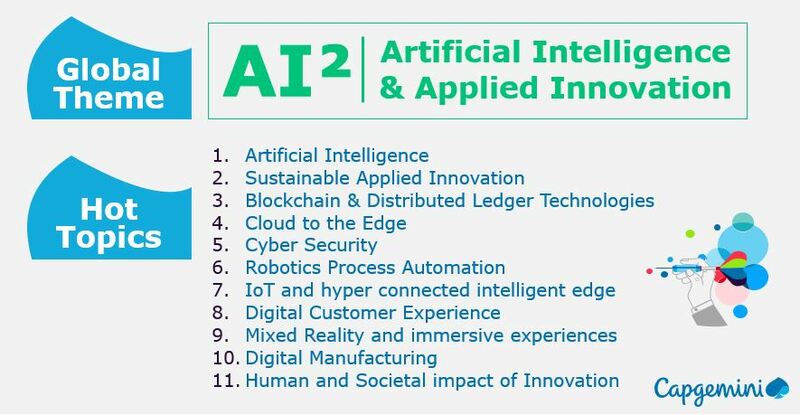 The events will cover the twin themes of Applied Innovation and Artificial Intelligence, along with numerous topics such as Blockchain, Cloud, Cybersecurity, Robotic Process Automation, among others. Interested in participating? Register now! TechnoVision 2018, Capgemini’s visionary thought leadership report is a crucial tool that helps you understand the world of technology drivers and their impact on your business. The 2018 edition marks the 11th anniversary of the TechnoVision series. Our experts bring you 37 compelling technology trend building blocks as a repository of inspiring, challenging, and disruptive perspectives exploring the main theme of “Artificial Intelligence”. Pre-register to receive an advance copy.